The NS-IC800 from Yamaha is a compact in-ceiling speaker ideal for discreet installations in home theaters, bedrooms, living rooms, and more. The coaxial 2-way speaker design has an 8" blue polypropylene mica cone woofer and a fluid-cooled soft dome tweeter to provide clear audio with a wide frequency response. The tweeter can be swiveled for precise aiming and the most effective high frequency output. The grille is paintable and has integrated magnets for quick attachment or removal. The speaker has a large mounting clamp with non-slip tread to firmly grip walls or ceilings for secure installation. 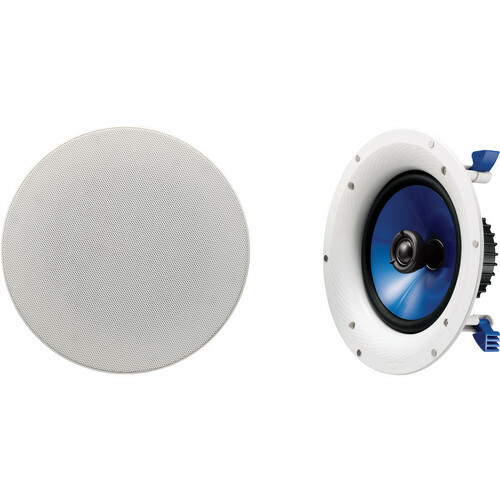 Box Dimensions (LxWxH) 14.1 x 13.5 x 13.0"
NS-IC800 8" In-Ceiling Speaker (Pair, White) is rated 5.0 out of 5 by 2. Rated 5 out of 5 by Sean from Great Speakers I have installed 8 of these in an new Restaurant there are a fantastic speaker the grill is magnetic which makes them easier to install. The speaker has an extremely low profile the blend right into the ceiling. the centre cone can be adjusted which makes aiming the speaker amazing. Rated 5 out of 5 by Airport Ops from Great speakers I installed these in a conference room. Work great, sound great, easy to install. Are these speakers ok for outdoor applications?